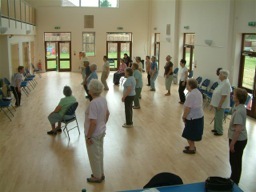 Extend classes use specially designed exercises for the over-60s or people of any age who are unable or do not wish to attend a more rigorous keep-fit class. The Extend classes are designed to improve and maintain mobility. The exercises are taught by a specially trained tutor and can be done standing or sitting according to ability. The Extend classes have proved very popular and people have felt benefit from participating - they are particularly useful for younger people who are unable to attend standard keep-fit or aerobic classes, due to back problems or joint replacement. 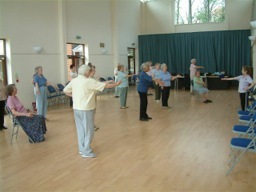 The classes run at St Mildred's Centre on Bingham Road. Class times may vary, depending on demand, so please contact the ANCA office. The exercises are designed as a series of gentle stretching and rhythmic movements, often to music. They are ideal for older people who just want to keep mobile, those recovering from operations or who are convalescing. The trained tutor is able to advise on the suitability of the exercises for people with special issues, such as hip or knee replacements. ANCA can arrange transport for those who find it difficult to get there on their own. This can be either by the Dial A Ride minibus, equipped for wheelchair access, or by a volunteer's car. There is a small charge for each session, which includes refreshments. Clients have expressed great appreciation for improvements in their physical mobility as a result of the exercise.